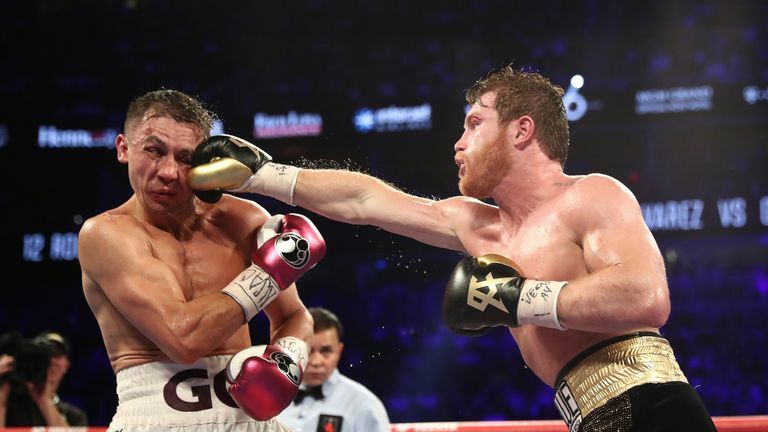 Saul 'Canelo' Alvarez won the WBA and WBC middleweight titles by inflicting a first career defeat on Gennady Golovkin with a majority decision in a brutal showdown. The Mexican's strong chin and even stronger resolve saw him go the distance and then take the three straps as Golovkin tasted defeat for the first time in 40 fights. Alvarez, speaking in the aftermath of his narrow victory, did not shy away from the possibility of another clash with 'GGG'. "If the people want a third fight, we will do it again. But for now, I want to enjoy the moment with my family and my people," Alvarez said. "But if they want us to do it again, no doubt. "It was very difficult and [Golovkin] is a great fighter. I tried to do [the knockout], but in the end, it was a great victory for Mexico. I want to thank my corner, which is the best in all of boxing. "I am a great fighter and I am a great rival and I showed that tonight." Golovkin, who was unable to speak to media immediately after the fight as the doctor was stitching up his eye, seemed unhappy with the final decision but was also keen on a third chapter to their feud. "I'm not going to say who won tonight, because the victory belongs to Canelo, according to the judges," said Golovkin. "I thought I fought better than he did. We would like to have a third fight, we will negotiate that, that's what we want." Even if you aren't a Sky TV subscriber, you can book and watch it at skysports.com/boxofficelive.